New Reviews of Comics and More! We’re back with our weekly comic book reviews! This week, we review Archie #627 (Archie Meets MISS Part 1), Angel & Faith #4, Teenage Mutant Ninja Turtles #4, and the Classic Marvel Characters: Iron Man figure. Check out our video below. MILD SPOILER ALERT! We’ll avoid any big spoilers, but we will give out a few details as we go. So were these comics and items Box-Worthy, Fence-Worthy, or NOT Worthy? Listen to our opinions and then post your own below. What did you think of these titles? What should we review next week? Post your comments below! We were fortunate enough to get some great interviews tonight, including with Archie Comics’ President Mike Pellerito! 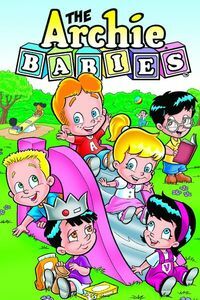 Here, Mike tells us about the success of Archie Babies, the new Kevin Keller series, the fantastic Best of Archie collection (I have a copy I’m planning on reading once I get my Con “homework” done), and their aggressive digital program! If you’re at Comic-Con, make sure to visit us at booth #5625 to get 50% off a raft of incredible graphic novels, plus save big on toys, statues, and more! Stay tuned for more amazing videos! What do you want to see next? Post your comments below! Vintage Archie from the 1960s. A funny thing happened over the last few years with Archie Comics, the venerable publisher of kid-friendly books like Archie, Betty & Veronica, and Sonic the Hedgehog: it’s moved to the leading edge of technology, and its story arcs and announcements are on the tips of everyone’s tongues. Digital comics? The Archie Comics app has been downloaded more than 1.8 million times. Big stories? 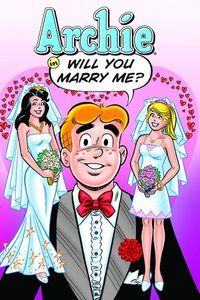 The Archie weddings created a perfect storm of publicity and led to the Life With Archie: The Married Life magazine, which is now distributed in places where no comics have gone before. Social issues? 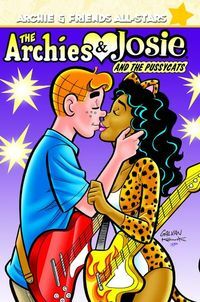 Archie has handled interracial romance with Archie’s relationship with Valerie, homosexuality with new character Kevin Keller, and even brought more diversity to the halls of Riverdale High with Alex Simmons’ “New Kids off the Wall” storyline. While Digital Comics Month is technically over, we will continue to report on new developments, and we jumped at the chance to interview CEO Jon Goldwater. Below, he talks about why Archie Comics has been so active on the digital comics front, how he thinks digital comics will affect traditional retailers, and how the company will continue to push the boundaries of good ol’ Riverdale. 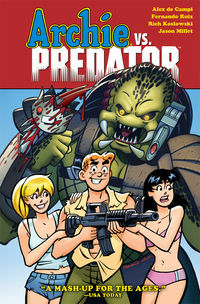 TFAW.com: Archie was one of the first comic book publishers to fully embrace digital comics. Why is that? The Archie Comics app on the iPad. Jon Goldwater: I’ve been with Archie for almost two years, and previous to Archie, I was in the music business for more than 20 years. I was on the frontlines, not literally, but as part of the music business, of the battle between old technology and new technology that went on between the music business and Napster, and I saw the disaster that was created and how horribly that was handled by the powers-that-be at the record labels. And I vowed, coming into Archie, that we’d take every opportunity to embrace new technology–and digital may not be “new,” but to put it in a comic book format is rather new. In the music business, we were always falling behind, and when I came in here to Archie Comics, I was determined that Archie would be the leader in new technology, that we would never make that mistake again, and that the company would blaze new trails and see how vibrant new technology is–and, frankly, that it can be monetized. The ability to make serious money by embracing digital is a reality. It’s not just a pipe dream. TFAW.com: You’ve also announced that you’re going to go day-and-date with your entire catalog in April, which is a very bold move, so this seems to be part of your initiative. JG: Yes. I think there’s two separate customers. You have the customer who loves to download a book on his iPad or iPhone, or whatever mobile device he might have, and you have the customer who wants to get the comic in hand. Then you have the very rare customer who wants both, which is a beautiful thing. Certainly, for us, it’s about making the book as widely available as possible, as quickly as possible, to as many people as we can. TFAW.com: Do you expect other publishers to follow your lead? JG: Absolutely. I think Marvel and DC and all the other comic book companies will follow our lead–as they’ve been doing, quite honestly, in everything we’ve been doing so far at Archie. We were the first company that had its own stand-alone app. Then Marvel and DC followed suit. I think they’re all going to follow us, after that. It’s either join in or be left behind, so I think they’ll join in. TFAW.com: The biggest concern for most publishers of going day-and-date is, of course, the worry that fewer customers will purchase print comics. Do you see that being the case? JG: I think there’s nothing like having the comic book in your hand. It’s a real art form. Everything we do at Archie is geared towards giving the best possible story, the best possible art–everything is geared toward giving people the best possible product. And that product is a book! However, if you don’t have the option to run to your comic shop, or supermarket, or newsstand, or wherever they’re available, I’ll tell you something: if you can download the book on your device, it’s a very close second. So that’s really our thinking. We just want to give everyone the opportunity to have their Archie comics. TFAW.com: The Archie Comics app has now been downloaded more than 1.8 million times. Who is buying it? Is it your usual audience, or are you reaching a more nontraditional comics demographic? JG: I think it’s both. I think yes, of course, the Archie fans are downloading it, but I think having it available to this many people–and that’s the one beautiful thing about the digital universe that we now exist in, is the availability to massive amounts of people. And because we are available to that many people, someone who may not normally be an Archie fan may check out that app and think, “Let me check out that comic book.” So yes, I think we are drawing, in addition to our fans, the people who would not necessarily buy an Archie book at the newsstand or the comic book shop, but they’re home, and they want to check it out, and at the price point our digital comics are offered, I think it’s a fantastic value. So I think it’s both. TFAW.com: As you’ve mentioned, Archie comics are already distributed far more widely than most comics, with supermarkets and newsstands. Do you think this has contributed to the success of your digital comics, or affected it in any way? JG: I do. I think it’s an awareness. The fact that you may be in your supermarket checkout line and see Archie there, waiting to be bought, whether you buy it or not, you see that Archie’s available. For us, it’s all about–and I know this seems like a tired word–branding. But that is the word of the day, and that is what this is: making our brand as visible and available as possible, not just with the supermarkets, but what we’re doing with the Life With Archie magazine, putting it in places like CVS and Walgreens, spots no comic books are in. But they’re quick to embrace magazines, and Archie’s there as well. It’s really making our brand as available and visible as possible. TFAW.com: What were some of the advantages of partnering with iVerse instead of creating your own store? JG: Well, first of all, those guys are fantastic at what they do, and we don’t have that capability internally to do that. I guess at some point we could bring that in-house, but I have to tell you, I am so happy with the job they do. They’re so smart over there in how they market and promote our app, and they’re doing a great job for us. You know the old expression, “If it ain’t broke, don’t fix it”–that’s how I feel about our partnership with iVerse. They’re doing such a terrific job that I’m just going to allow them to keep moving forward with what they’re doing. TFAW.com: What do you think digital comics will mean for retailers in the upcoming years? JG: I think it’s two separate markets. I think the traditional retail market needs to keep fighting for visibility or awareness, and make sure things are presented in the easiest and most consumer-friendly way. I don’t think digital comics really impacts them in the way that a CD was impacted by a digital song being available. I believe in my heart and soul that the comic book is an art form. I don’t think that’s ever going to go away–it’s not just something that’s disposable. It’s something that’s important and something you value, and I think traditional retailers have that edge. If they present themselves in a way that they can really take advantage of that ability to promote what they have as something important, they’ll do just fine. I don’t think that will hurt them at all. TFAW.com: Does Archie plan to include any retailer incentives or include traditional retailers in its digital comics program? JG: It’s funny, we’re talking about that right now, so there’s an announcement coming very very soon. I think next week you’ll get some interesting news about that. TFAW.com: Archie has gotten a lot of press, not just from its digital announcements, but with events like the Archie weddings, and in adding diversity with the “New Kids off the Wall” story arc. How do you plan to build on this momentum? JG: We’re just going to keep growing and doing what we’re doing, and putting out the best possible stories. We’ve stretched the boundaries of what Riverdale was, and we’re reflecting what kids today are dealing with in their own schools. Kids today are dealing with a lot of stuff. As long as we maintain it within the integrity of what the Archie characters are, within the confines of Riverdale, there’s a lot of things and a lot of fun we can have with Archie and the gang. And at the same time, we sometimes give readers a little bit more to think about than we have in the past, but within the confines of what we would find in Riverdale. TFAW.com: I spoke with Alex Simmons a couple of months ago, and he was really excited about his plans for Ethel! JG: Yeah! You know Alex, man, he is a creative genius. He really is. And he actually is such an important writer, because he really digs deep, and at the same time, he still maintains that light touch. We have a very important book that he wrote that’s coming up soon, that’s probably the best book Alex ever wrote, and as soon as we’re ready to talk about that, I’m going to have him give you a shout, because he’s written a very important book with Archie Comics. TFAW.com: That sounds awesome! The other big announcement is that you’ve dropped the Comics Code. How long have you been considering that, and what made this timing ideal for you? JG: We’ve actually been thinking of doing it for quite awhile. Because we’re self-policing here at Archie. Our motto is, when a parent buys their child an Archie comic, they have certainty: they know what’s in it in terms of the parameters, the boundaries that we’re going to go to. So for us, the Comics Code Authority was a bit antiquated. We’ve established who we are, this is our 70th year in business, and there was really no point in it anymore. We’re very much into making sure that what we do is the right thing. TFAW.com: Is there anything else you’re particularly excited about and want to talk about? Well, we have the Kevin Keller stand-alone miniseries coming out in June–we’re very very excited about that. Dan Parent wrote some unbelievable stories, and the first issue of Kevin was brilliant. It’s such an important book for us that when I read that issue, I got emotional, and at the same time I laughed. That’s how great Dan Parent’s issue #1 of Kevin Keller is. So look for that in June. 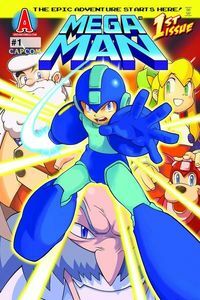 We have our Mega-Man comic coming out in April. We have a new partnership with Capcom. And then we have our Stan Lee comics! We have a deal with Stan, and Andy Hayward, and you’ll see the previews of that at Comic-Con in San Diego, and then the first issue will be out in September of this year. TFAW.com: Are you doing superhero comics with Stan Lee? TFAW.com: Well, thank you so much for your time! JG: Thank you so much! You can check out our Archie Comics page here on our site! Plus, learn more about Archie and Stan Lee’s upcoming Secret Seven superhero comics over at Newsarama. Have you downloaded the Archie Comics app? 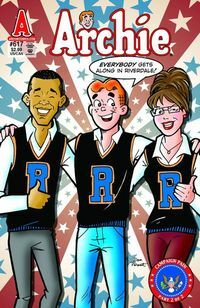 Has all the hubbub revived your interest in Archie? Post your comments below!